St Paul's Cathedral: May 2018, St Paul's Cathedral officially joined the membership of the CCA. In doing so its Head of Security becomes a member of the association's Leaders' Council. Canterbury Cathedral: May 2018, a young woman was saved from an attempt to jump from 230ft high scaffolding at the Cathedral. Inspector Morley from the Cathedral, assisted by another member of the Cathedral's staff saved the young woman and, with the assistance of police officers escorted her to the ground. CCA: Chief Officer Joseph Hobson was awarded the CCA President's 2018 Award for his outstanding commitment to the organisation and safeguarding Cathedrals. The award was presented by CCA's President, John Key. 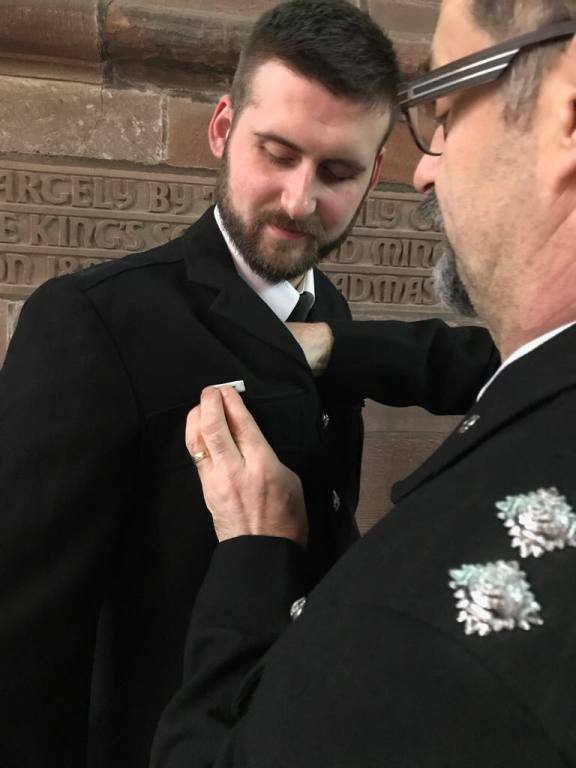 Chester Cathedral: December 2017, Constable Sam Jones was awarded a commendation jointly by the CCA and Chester Cathedral for the professional way he handled the tragic suicide of a man at the Cathedral. 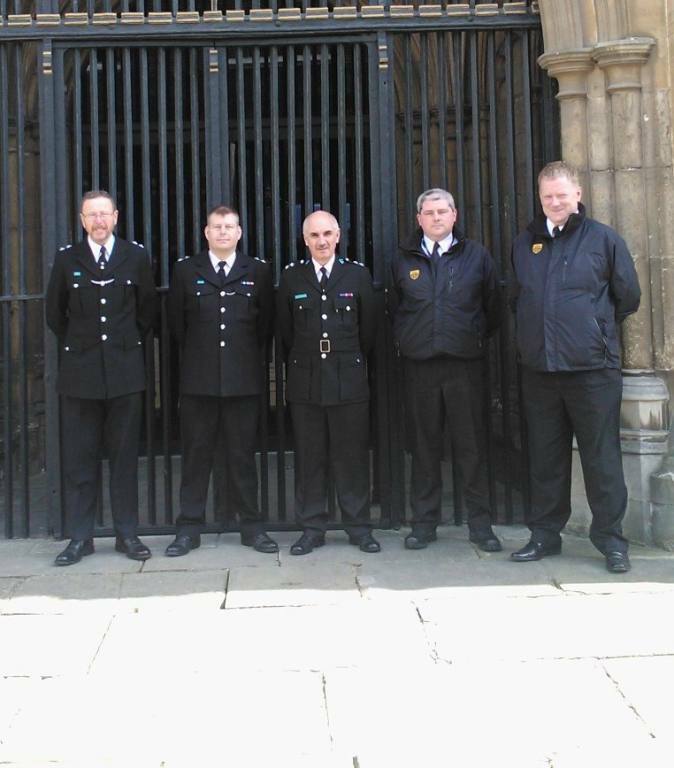 CCA: October/November 2016, Eight officers from the York Minster Police and two from Canterbury Cathedral successfully completed the Level 3 Certificate in Cathedral Constable Attestation. The CCA Leaders' Council wishes them well and and like to offer its sincere congratulations. The association's registered centre also achieved an excellent report from NCFE following their external moderation visit, being rated as excellent in all areas. CCA: The association has launched a new national cap badge for cathedral constables as can be seen in the side bar. CCA: The association, working with the national awarding body NCFE, has developed a level 3 qualification - the Certificate in Cathedral Constable Attestation. 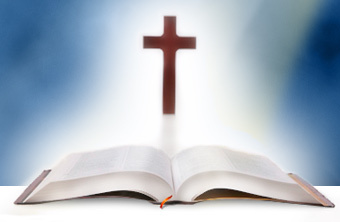 Designed for serving officers, it provides the knowledge, development, and understanding for the use of powers in a cathedral constabulary context. CCA: January 2016, the CCA has adopted a royal blue and white chequered diced cap band, known as Sillitoe Tartan. 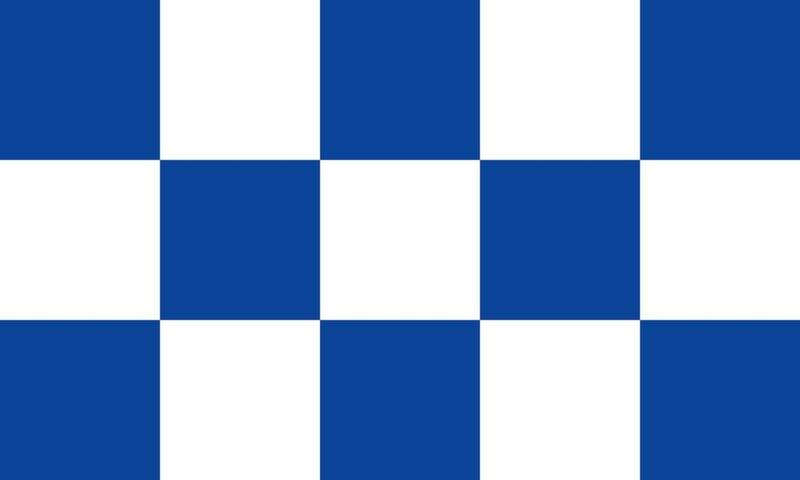 This is to distinguish cathedral constables from regular police officers when working together, a decision made by the CCA Leaders' Council. Canterbury and Liverpool Cathedrals: January 2016, the Dean and Chapter authorised further constable attestations at the their respective cathedrals. Another example of looking to our past heritage to safeguard the future. Chester Cathedral: December 2015, the cathedral's constables commence training with members of Cheshire Police Special Constabulary. 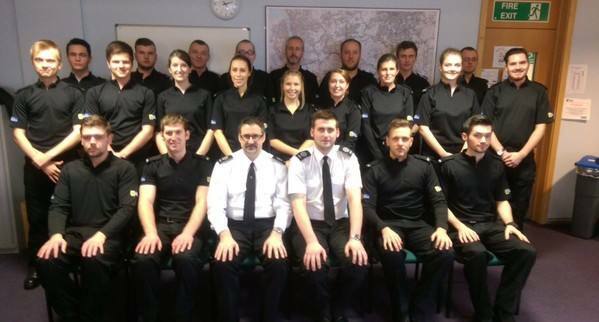 The officers will follow the same training programme as their special constable colleagues, helping them develop their skills and knowledge of local policing procedures. CCA: August 2015, seven cathedral constables were attested by a Justice of the Peace at a special ceremony within the Consistory Court of Chester Cathedral. The service was lead by the Vice Dean of Chester Cathedral. This historic event, restored to those attested, the powers and privileges of constable within the Cathedral and its precinct. The first officers to be attested in over 60 years. CCA: May 2015, following discussions with Merseyside Police and Crime Commissioner, it was acknowledged that it was a matter for the Dean and Chapter of a Cathedral if, under common law, they wanted appoint attested constables; something they had previously done for nearly 800 years. Canterbury Cathedral: On the afternoon of Thursday 2th March 2015, HM The Queen and HRH The Duke of Edinburgh paid a private visit to Canterbury Cathedral for luncheon and a dedication Service to the unveil two new Royal Statues of themselves, which are now situated outside the West End of the Cathedral. Weeks of preparation between myself, Kent Police and Royal Protection teams took place off site to keep details of the visit out of the public domain for security reasons. On the day of the visit the Cathedral Precincts were closed to the public and only selected guests, staff and their families were permitted onto the site. Close Constables provided the security within the Precincts and carried out bag searches and guarded the gates to the Deanery which was the venue of the private lunch, after the lunch the Royal Visitors made their way by car to the west end of the Cathedral with the route flanked by pupils from Kings School and staff waving flags. After the Service and Unveiling Ceremony staff, which included Close Constables were presented to the Queen and HRH Duke of Edinburgh at Tea. It was a lovely private occasion and one which our officers could take pride and wore their parade uniforms. CCA: January 2015, the association has been recognised by the Association of English Cathedrals and is featured on their website. CCA: January 2015, the assoication, has through the Deans' Conference, arranged for all Cathedral Deans to be given an anti-terrorism briefing by Special Branch officers in February 2015. CCA: November/December 2014, the CCA Chief Officer became a qualified instructor in conflict management, self-defence, and physical restraint (including the use of handcuffs). New training for constables will be rolled out in January 2015. The CCA is grateful to the Friends of Liverpool Cathedral for their support in financing the Chief Officer's training. It is hoped that the conflict management training will be rolled out to other public facing staff and volunteers, as required. 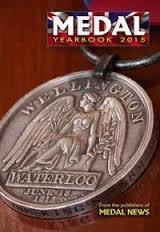 CCA: 25 September 2014, the Association's Faithful Service Medal was included in Medal Yearbook 2015. This publication is the most comprehensive guide in respect of medals, orders, and decorations. 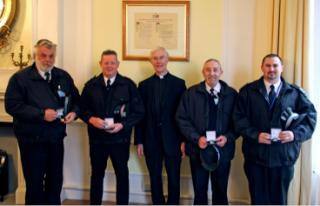 The CCA is proud that their medal, which is awarded to Cathedral constables for long and faithful service, has been included. Chester Cathedral: Friday 12 September 2014, HRH Prince Charles and HRH Camilla visited Chester Cathedral. Head Constable Chris Jones worked extensively with Chester Police and Royal Protection Special Branch officers on all matters of security. Within the Cathedral Chris co-ordinated internal security. He was joined by three constables from Liverpool Cathedral, who in addition to providing security, also provided a pastoral aspect to policing the event. The event was a great success, and unusually for Royal visits, the Cathedral remained open to the public, giving visitors an unexpected bonus to their experience. CCA: 20 August 2014, the Association held its annual AGM. Attended by officers from York, Liverpool, Chester, and Canterbury Cathedrals, the event was well received. A number of training seminars were held, including a very thought provoking update from Special Branch officers about the risks posed by terrorists. CCA: 4 August 2014, the Association's Chief Officer, Brother Joseph Hobson, was invested into the Military and Hospitaller Order of St Lazarus of Jerusalem. The MHOSLJ is a chivalric order of knighthood, founded circa 1098 by the crusaders of the Latin Kingdom of Jersualem; dedicated to upholding the Christian faith, to assist and help the vulnerable and the sick, and to promote Christian principles of chivalry and work for Christian unity. Liverpool Cathedral: May 2014, the Cathedral hosted the 75th Anniversary of the Battle of the Atlantic. Present was the Princess Royal. The constables, working with local police and Special Branch officers, conducted searches, and ensured the overall security of the event. CCA: 14 May 2014, the Association plans to hold a constables' event in Liverpool in August 2014. This will be the first occasion when constables have been invited to meet as a body, other than the meetings of the CCA Leaders' Council. The event, which will include training and social opportunities, will be hosted by Liverpool's Anglican Cathedral. Liverpool Metropolitan Cathedral: 10 May 2014, The Association is pleased to welcome as members the team from Liverpool's Roman Catholic Cathedral. CCA: 3 April 2014, The Association's Leaders' Council met for its meeting at Canterbury Cathedral. During which John Deal (Deputy Head Close Constable at Canterbury) and John Key (CCA President) were presented with a long service bar for serving over 20 years. The presentation was made by the Dean of Canterbury Cathedral, The Very Revd Dr Robert Willis. The Council also agreed the wording of an oath to be taken by Constables/Yard Beadles. Canterbury Cathedral: September 2013, Close Constable Tim Sharp of Canterbury Cathedral and two friends took part in ‘Tough Mudder’, a 12 mile-long obstacle course designed by the Special Forcesto test your all round strength, stamina, mental grit, and camaraderie, They successfullycompleted the challenge and managed to raise over £1,000 for Muscular Dystrophy. Well done Tim! CCA: 24 October 2013, the association held its first ever Leaders' Council meeting at Westminster Abbey. During the meeting the association's constitution was adopted; John Key became its first honorary president; and Br Joseph Hobson elected its chief officer. The meeting was attended by the head constables and chief beadle from the represented cathedrals. Liverpool Cathedral: 15 October 2013, Les McKenna and Steve Pasztac were awarded a commendation by the association for the courage they had displayed during the arrest of a disturbed youth who was brandishing a BBQ fork. He also had a large knife fastened to his leg. He had broken into student accommodation back in 2003 and was threatening them. The youth was wanted by police for an attempted murder earlier that day in the city. The commendations were presented to the officers by Dean Pete Wilcox. This courage was not regognised at the time and the CCA decided to redress this. For fuller information see the commendations page. Liverpool Cathedral: July 2013, saw for a two week period the Cathedral's busiest time for the constables as they oversaw security arrangements for the student graduations of Liverpool's John Moore and Hope universities. Chester Cathedral: July 2013, will see the Close constables working closely with local police to deter anti-social behaviour in and around the Cathedral's precincts. Some of this work is being filmed by Channel 5 for a fly on the wall documentary. Liverpool Cathedral: 26 May 2013, the cathedral's constables were kept very busy overseeing the security at the 75th anniversary of the Battle of the Atlantic. 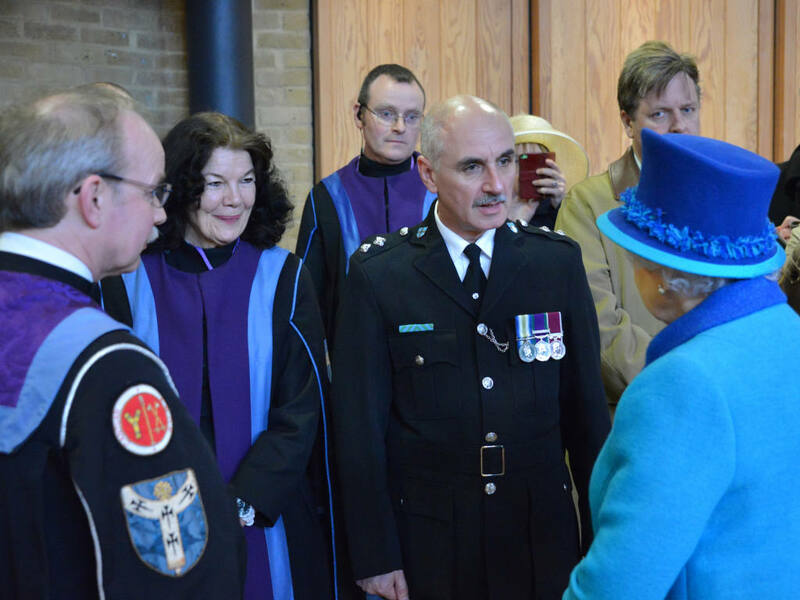 The service, which is held annually at the Cathedral, was attended by Princess Anne. Canterbury Cathedral: 22 March 2013 saw the Close constables oversee the security arrangements for the enthronement of Justin Welby as Archbishop of Canterbury. The event, which was attended by Prince Charles, the Prime Minister David Cameron, and many other church and community leaders was conducted under strict security. 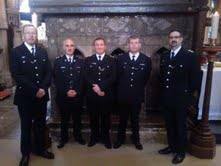 Canterbury Cathedral: January 2013, four of the Close constables received their faithful service medals presented to them by the Cathedral's Dean, the Right Reverend Dr Robert Willis. The recipients were: Terry Baldwin, Laurence Kelly, Wayne Deal, and Geoff Kember. Chester Cathedral: 13 December 2012, the Close constables reported seeing over 50 people using the Cathedral's grounds as a public toilet over a period of four nights in December. Consequently a joint operation between the constables and the local police was held over two nights. The operation proved so successful that 14 local people are now awaiting court appearances. Chris Jones, the Cathedral's Head Constable said, 'The Cathedral Constabulary at Chester looks after the security and wellbeing of the Cathedral and has been busy reducing anti-social behaviour around the estate'. 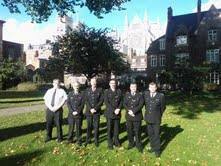 Canterbury Cathedral: December 2012, Matthew Seldon-Holland is appointed as a close constable at the Cathedral. He will replace Constable Terry Baldwin who retires in March 2013, after 14 years service. We wish both officers, one at the beginning of his career, the other at the end of his, our best wishes. 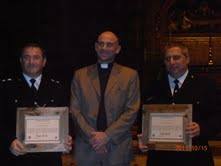 Liverpool Cathedral: November 2012, Br Joseph Hobson and Kevin Dunn appointed as constables. 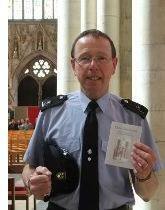 Br Joseph was previously a volunteer constable at the Cathedral. York Minster: 30 September 2012, saw the Minster hold the National Police Memorial Day. The service is held annually to remember serving police officers who have died in the preceding 12 months. Sadly it included PC Fiona Bone and PC Nicola Hughes, murdered just weeks before in Manchester. Our hearts and prayers go out to the families, friends and colleagues of these courageous officers. The service was lead by the Archbishop of York, Dr John Sentamu, and was attended by many dignitaries (including the Home Secretary, Theresa May), together with hundreds of serving and former police officers. The security of the event was undertaken in conjunction with Minster Police. The CCA was proud to have an article about the history and the work of the Minster Police included National Police Memorial Day Order of Service brochure. A fuller account of the day, written by York Minster Policeman, John Key, will be added at a later date. But we give our heartfelt thanks for the officers who safeguard our communities day in and day out. CCA: 18 August 2012, the association introduced its new crest. Canterbury Cathedral: 27 July 2012, Close Constables Harry Wales and Victor Stevens were presented with their Cathedral Constable Association medals for 'Faithful Service' by the Rt Revd Robert Willis, Dean of Canterbury Cathedral. Both recipients have completed 11 years service at Canterbury. Canterbury & Chester Cathedrals: June 2012, The Close Constables of both cathedrals received their Queen's Diamond Jubilee commemorative medals. Liverpool Cathedral: 29 June 2012, two of the Cathedral's constables, Les McKenna (Head Constable) and Joseph Hobson gave a lecture on the work and history of cathedral constables to a national conference on 'Modern Activism'. The event was attended by academics, layers, magistrates, social and welfare activits, policing prison, and youth justice services. The officers received plenty of questions and positive feedback about their 'very interesting presentation'. Liverpool Cathedral: 1 June 2012, the Cathedral's team of constables were presented with their Queen's Diamond Jubilee commemorative medals by Acting Dean Myles Davies. The medals were awarded to all constables who were in service on this day. Liverpool Cathedral: 17 May 2012, two constables - 1102 Steve Pasztak and 1105 Ritchie Higginson attended court to give evidence against a young man who had been arrested for drunk and disorderly in the Cathedral back in December 2012. He was keen to have his day in court, but this proved to be a costly day; he was found guilty and ordered to pay a £480 fine and warned about his future conduct. Liverpool Cathedral: February 2012, the Cathedral announced that it was making a donation of £2,075 to the Tariro Project, a charity providing children's homes and orphanages in Zimbabwe. 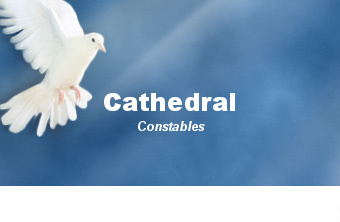 The dontation, orginally sponsored by the Cathedral's constables as their chosen charity, 'will make a considerable difference to the children for whom we care and I am thrilled and delighted that the Cathedral has chosen our charity. I wish to extend my thanks to the constables for their support in sponsoring us,' said Fr Nicholas Stebbing CR. CCA: 06 February 2012, The association would like to extend our congratulations to Her Majesty The Queen in celebration of her Diamond Jubilee. As not only our Head of State, but as the Head of the Church of England, her service has been outstanding both to her subjects, and to God. York Minster: 10 January 2012, John Key (a now retired Minister Policeman) has been awarded the CCA Faithful Service Medal for his outstanding services to the Minster. John, who retired last year, served for over 25 years at the Minster. During his time he recorded some of his memories, which were later published in his book, 'Close Encounters - Reminiscences of a Minster Policeman'. John also did a sterling job of recording the history of the Minster Police; indeed the idea of having a 'Cathedral Constable Association' was first conceived by John who forged links between the cathedrals and the constables they employ. Chester Cathedral: 4 January 2012, the Cathedral released the badge design for its newly formed ecclesiastical constabulary. The design, which is inset with the Chester Cross, and surrounded by the words, 'Chester Cathedral Constables', is set within an eight pointed elliptical star. The badge can be seen in the sidebar of this page or by visiting the 'Chester Cathedral Constables' page. Liverpool Cathedral: 12 September 2012, saw the Cathedral's constables manage one of its biggest ever events, albiet a very solemn one. The publication of the Hillsborough Independent Panel's disclosure report brought together the families of the 96 men, women, and children killed in the 1989 disaster at the Sheffield Wednesday Football Club ground. The publication also attracted much national and international media attention, with hundreds of television cameras and reporters in attendance, each eager to get a scoop. Fortunately for the families, who acted with the great dignity throughout the day, the constables kept the media out of the Cathedral, and very much at arm's length. Not an easy task given some of the underhand methods employed by some elements of the media to gain access to the families. 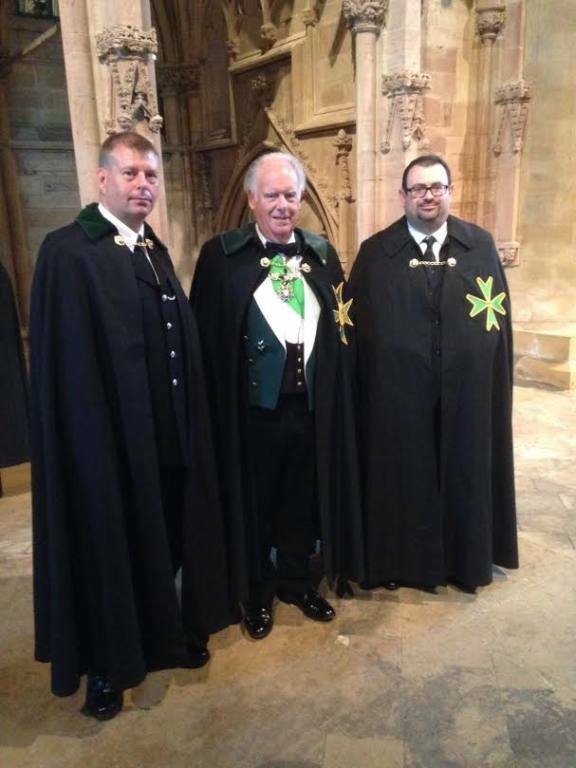 The security of the event was undertaken solely by the Cathedral's constables. This was at the request of the Home Office, which, out of respect, and at the request of the families, did not want the disclosure report event policed by Merseyside Police or stewards. The day passed without any security incidents; confirming the Home Office's decision to police the event using only the Cathedral's constables, to be the right one. The constables would like to pay their own personal tribute to the courage, determination, and dignity shown by the Hillsborough families and survivors. The work of the City's Bishop, the Very Reverend James Jones (the Panel's Chair), is also to be highly commended. Liverpool Cathedral: 26 August 2012, Constable 1105 Andrew Lewis confronted a man attempting to break into one of the Cathedral's donation boxes. Observed on CCTV, Constable Lewis challenged the man who immediately became aggressive and pulled out a syringe full of fluid. Shouting 'I have AIDs', the thief sprayed the contents at the constable. He then ran out of the Cathedral with Constable Lewis in pursuit. The thief got onto his bicycle and rode off. However, he crashed off his bike outside the Cathedral's gates. Catching up to the thief Constable Lewis again challenged him; this time the thief pulled out an offensive weapon and threatened the officer, finally getting back on his bike he rode off. Another example of some of the dangers faced by cathedral constables.